The Simmal team is experienced in producing components for application in nuclear power stations. A customer in the nuclear sector required a bespoke ‘channel’ extrusion to be produced and machined. It was of extreme importance to produce the ‘channel’ with as small a deviation in the width of the gap between the legs as possible. This factor was pivotal for the effective control of critical contact points on the internal surfaces of the legs. The profile was over 200mm wide, 223mm high and had a wall thickness of more than 10mm. Simmal worked closely with one of our precision extrusion partners to have the tooling made. This included the development of a new handling and production process devised specifically to meet the quality and inspection requirements. A major investment was also made in brand-new CMM equipment to check, verify and document the material’s conformance to specification. Simmal’s engineers can perform specialist engraving for easy product traceability – perfect for the nuclear industry. 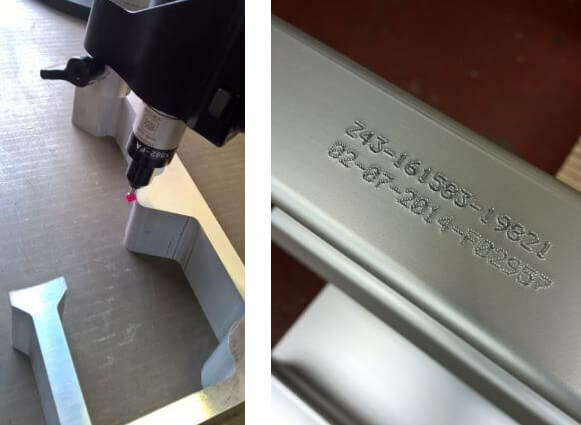 Full traceability was achieved from the cast to the billet, extruded profile and machined components. This continued right through to the complete, assembled product. The ability to trace product origin was key to meeting the quality requirements of the contract, with each critical component uniquely part marked to allow full traceability throughout the multiple processes. A bespoke inspection department was also created and bespoke operating procedures implemented to show commitment, develop skills and prove that the consistently accurate components and assemblies produced at Simmal met the demands of the job. This quality and safety-critical way of working illustrates our skillset required for continued operations within nuclear engineering.